Microsoft continues to introduce Fluent Design principles to different corners of its desktop operating system. Reports now suggest that it’s time for File Explorer to finally get some attention. The first Windows 10 2020 (the April 2020 Update aka the 20H1 branch) will reportedly introduce the updated File Explorer to the public. Since the company has already started to push builds from this particular branch to Windows Insiders signed up with Skip Ahead, if this report is true, we should be able to have a peek at the new File Explorer in the coming months. Fluent Design remains a hotly debated topic among Windows enthusiasts with some favoring the new design language and others considering it as a primary reason behind their decision to stay with Windows 7. Regardless of how some users may feel, Windows 10 continues to introduce Fluent Design to different parts of the OS. With File Explorer being one of the most frequented places in the operating system, it makes sense for Microsoft to make it look and act similar to everything else. It won’t, however, only be about looks. The update will extend the aesthetics and functionality of Windows File Explorer. The new Windows 10 File Explorer will reportedly (via HTNovo) be tied to different features of the OS, like Sets. It should be noted that while introducing Fluent Design back in 2017, the company had said that “Fluent Design will deliver intuitive, harmonious, responsive and inclusive cross-device experiences and interactions.” It wouldn’t be surprising if the upcoming design overhaul planned for File Explorer does indeed add in some cross-device experiences. It will be interesting to see what Microsoft is cooking up internally, but we will probably have to wait until the release of the upcoming Windows 10 April 2019 Update before the Windows maker could introduce any significant features from the 20H1 branch to Insiders. 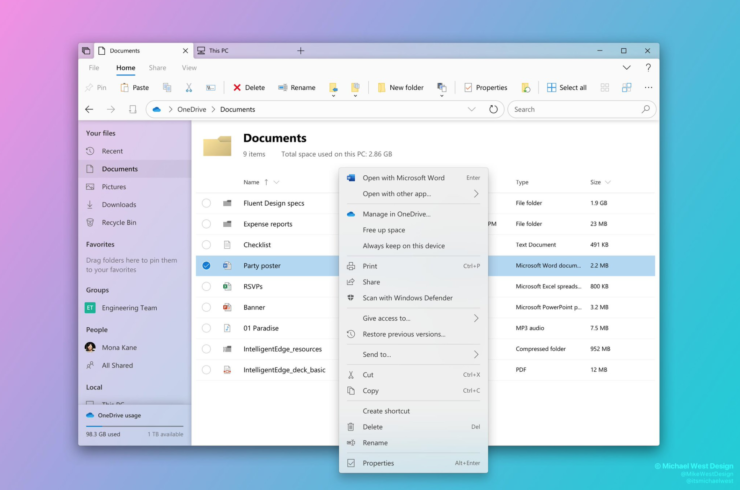 While that happens, Michael West, the Windows Design MVP, posted a Fluent Designed File Explorer concept last week. It isn’t going to be the official look, but it does follow the guidelines of Fluent Design (image shared above). Microsoft has skipped working on Windows 10 19H2 (fall 2019 update) in favor of Windows 10 2020 (20H1). The company said that some things in 20H1 require longer lead time. If File Explorer is indeed getting a facelift, it could be the reason why Microsoft has begun developing Windows 10 20H1 a year in advance.